That's it Folks, Goodbye Tinkatolli! We are very sad to announce that Tinkatolli will be closing it's doors at the end of January 2014. We started working on Tinkatolli way back in 2008, with the goal of building a virtual world that would inspire kids to be creative - both online and in the real world. We tinkered together the best game we could imagine and we had a great time doing it. We are proud of what we accomplished and thrilled to have made so many kids and parents happy. We are thankful for all of the support we have had along the way. From the players who made fan blogs and tweeted about Tinkatolli enthusiastically (some before we even launched), to our generous Kickstarter backers, to the awesome people who helped us build the world and to the Tinkatolli members who gave us hope that one day Tinkatolli would grow into a succesful business. Unfortunately, although Tinkatolli has grown into a wonderful community of kids, it hasn't grown into a sustainable business. It is a lot of work and money building and running a virtual world and in the past two years who have seen quite a few worlds - bigger than Tinkatolli - close down. Despite this, we kept chugging along and hoping we could make it work. After much discussion, trials and tribulations - we have decided it's time for us to move on. We gave it our best shot, but it wasn't enough to sustain our labour of love - and our families and loved-ones. All membership sales and the ability to create new accounts will end December 31, 2013. The game will remain open for the full month of January. If your membership expires before the game closes, you will still be able to play as a member until the end of January. We know many of you will be as sad as we are about this. Despite that, we hope you have a great time in the coming month. Login, and hang out with your friends. Talk about the fond memories. Throw a few final parties. Take screenshots of your home, Tinkas, backpack, scrapbook etc. as keepsakes! 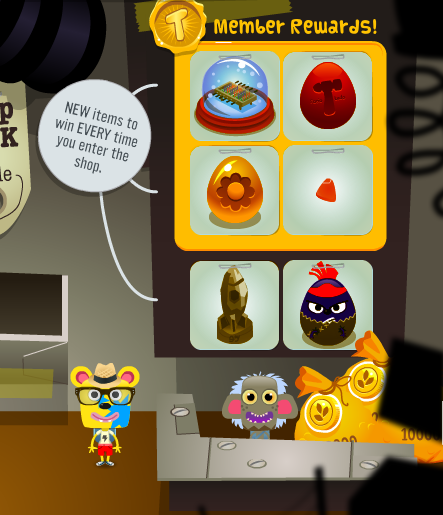 What next for the makers of Tinkatolli? We're going to keep building, but we'll be focusing on smaller things. We've decided to put the enthusiasm and energy we put into Tinkatolli into making apps. In fact we have a new one, called Meebitz, coming out soon. We hope you'll join us as UOVO (our old company) gets back into action. Thanks for everything - we'll miss you. It's been quite a ride! It's really sad to see Tinkatolli close! It was a GREAT Virtual World and it will always have a special place in our hearts. Thank you, Kevin, Luke, Konrad and Pennie (for the funny moments!) for everything you've done. 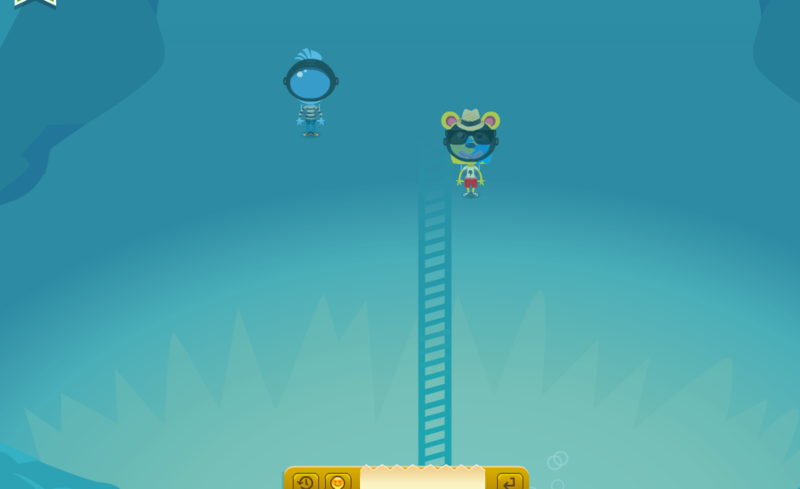 Lots of players enjoyed Tinkatolli, and everyone will be sad that they'll loose their favorite game. For our awesome blog readers, thank you for everything and participating in our activities. It was a honour for us to deliver all the Tinkatolli news. We will never forget the classy Egg Hunts, The events and the new clothing! With all these news, as of now, 30/12/2013, we reached 93,634 views THANKS TO YOU! The blog won't be closed and you can still chat with us on Twitter (@TheGelu, @Cheweh, @DuksterDude and @Lukey140701)! A new room for members is out now! It's called The Deep End and can be accessed from Sundunia. 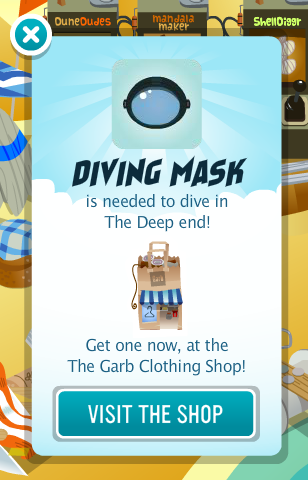 However, you will need a Diving Mask to access the room. 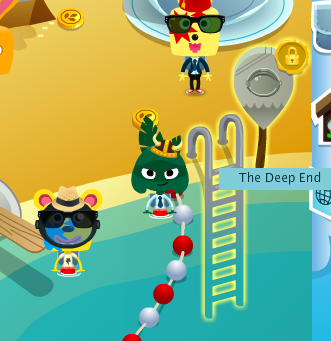 Here you can swim and have fun with friends! Awesome! Dirty Dozen has updated once again! Now, members can get 6 different items and non-members two. That's an awesome chance for members to get even MORE unusuals! 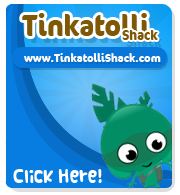 Summer is here, and we have new Tinkatolli Clothes for this hot season! All these are members only, but the staff will add soon more for everyone!